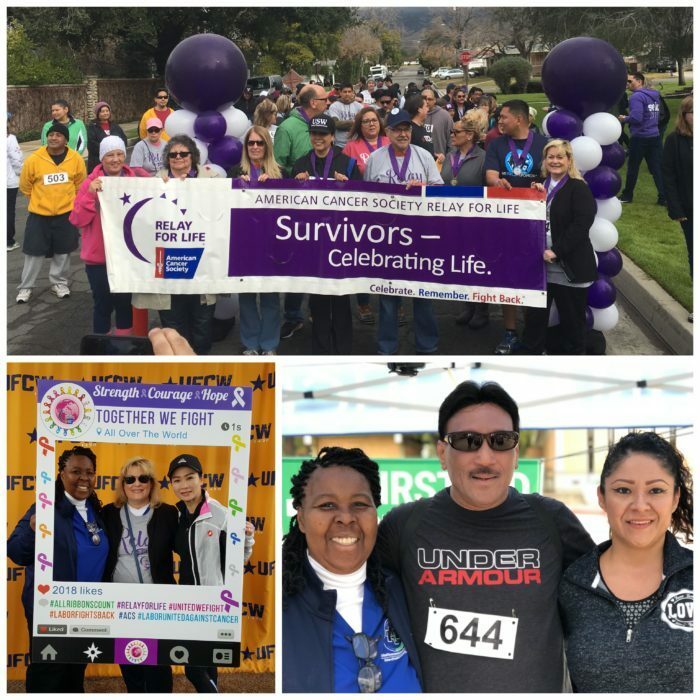 For the third year in a row, we linked arms with the American Cancer Society and the United Food and Commercial Workers (UFCW) Local 1428 to raise funds and awareness with our 5K: Labor United Against Cancer on Saturday, March 3 in San Dimas, CA. The forecasted rain did not dampen spirits as the program commenced. UNAC/UHCP Secretary Elizabeth Hawkins, RN, joined fellow cancer survivors on stage in being honored for their courage and strength in their battles against cancer. Survivors then led all participants in the first lap around the park. The survivor lap is an emotional experience for many and a reminder to celebrate life and cancer survivorship. As participants completed their laps around Civic Center Park, UNAC/UHCP members kept participants safe by hosting a first aid station. Baldwin Park RN and member of the UNAC/UHCP Board of Directors Jacqueline Asfall, Downey Regional Service Center pharmacist Ruben Kadir, and Olympia Cortes all volunteered to provide first aid. Together with our union brothers and sisters, we raised more than $40,000 to support the American Cancer Society’s cancer research, education, advocacy, and services. Way to keep our communities safe and healthy!